Deployments are hard on kids. No matter how old they are, they miss their deployed parent, and they often don’t understand why they are gone, or how long the deployment will last. Bedtime can be an especially challenging time, particularly if the deployed parent was usually involved in the bedtime routine. Did you know that there are people who volunteer their time and talents to make your kids more comfortable at bedtime? 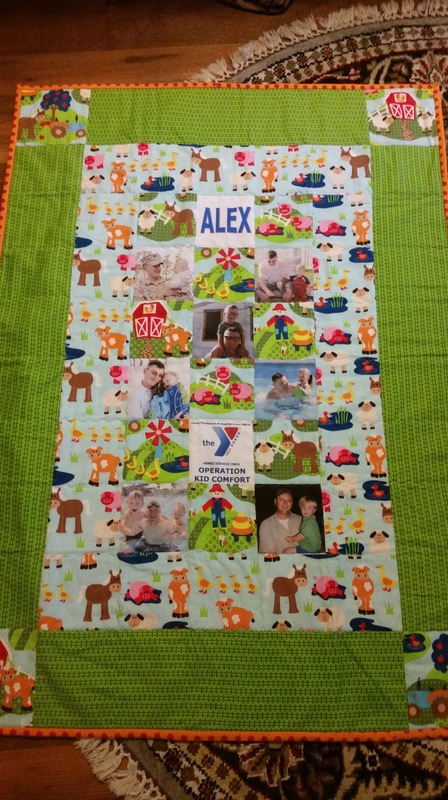 They create personalized quilts with pictures of your child and their deployed parent! They also make pillows for kids ages 8 and up. The quilts are just one of many things that military families can receive for free during deployment. The program is called Operation Kid Comfort, and it is offered by the Armed Services YMCA (ASYMCA). The deployment quilts are FREE! It’s a nationwide program available at most military bases. If your spouse is deploying soon, or is already deployed, then contact your local ASYMCA. They can make one quilt for each child in the household who has not previously received one. They will ask you to email 7 photos of the service member for each quilt. Each photo MUST show the service member’s face (it can’t just be pictures of the child.) It can include pictures of just the service member (like in uniform) or without the child, such as a wedding photo. If you are pregnant but the service member hasn’t met the baby yet, you can include photos of just the service member. The quilts take an average of 3 months to be sewn. It can sometimes be longer. All the work is done by volunteers. 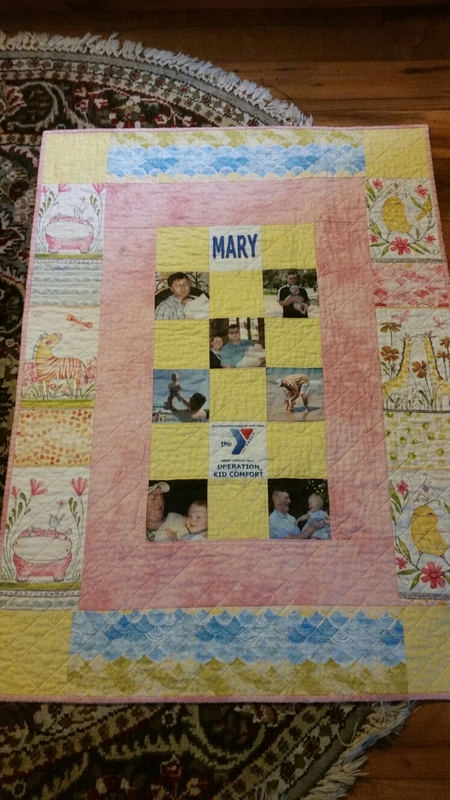 Each quilt will be custom, showing your child’s name, and the 7 photos you emailed them. You do not get to make choices about colors and styles. We recently received ours for the 3 younger kids (oldest child has one from her first deployment.) They are gorgeous! The quilts are usually not mailed, to save on shipping costs, so you typically have to pick them up at a location on base. But a shipping option may be available if you are not living near base for the deployment. You will receive the name of each volunteer who made a quilt for you so you can write a thank you note for each one. What are some good ways to use your Operation Kid Comfort quilt? Well, our kids have been carrying them around, curling up with them, sitting on them, and showing them off to friends. I can confirm that Operation Kid Comfort is certainly bringing my kids comfort and joy! The Kindergartner sleeps with his quilt on top of his covers, and says it is like Dad is giving him a huge hug. I draped the baby’s quilt over the side of her bed so she can look at the pictures. It is a good way to keep the baby connected to Daddy. She likes to point at it, and says ‘Daddy!’ with a huge smile. She also tells him, ‘Night – night Daddy’ when I tuck her in, and she gives kisses to each one of his pictures. It’s adorable! *Update* Even after deployment ended, she still asks for ‘Daddy’ to be draped on the side of the crib before she goes to sleep! Want to learn more about getting a quilt or becoming a volunteer? 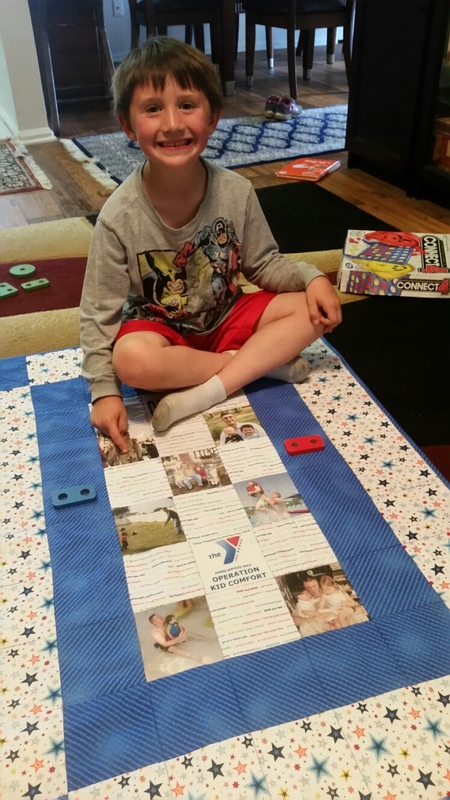 Start by visiting the ASYMCA website to see if your quilt will come from your local base or from their headquarters. 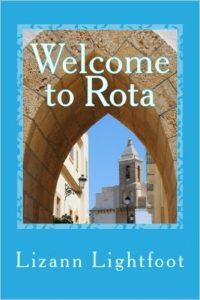 Contact information is provided for any area of the country. If you know someone who quilts and might like to volunteer, they can learn more about the thousands of other ASYMCA volunteers here. 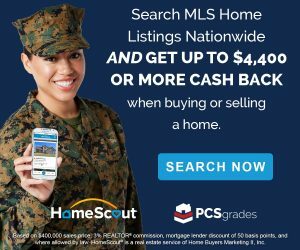 I hope that many others will be able to benefit from this great program that supports military families! 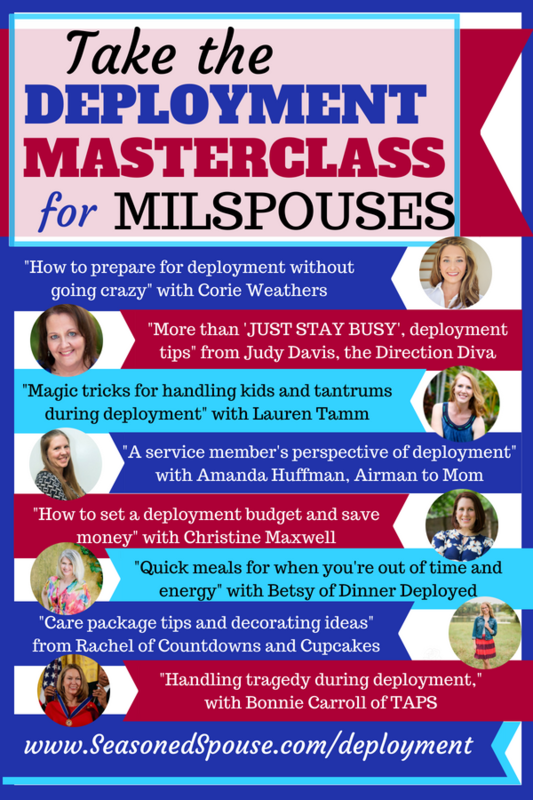 Want more tips to help you through a deployment? 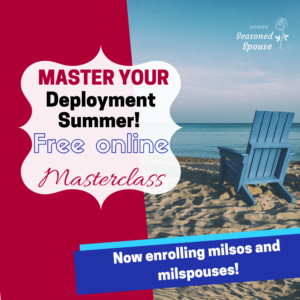 Take the Deployment Masterclass! It includes all these videos with deployment experts, plus the 28-page Ultimate Deployment Guide, and a supportive Facebook group. Hooray, I am so glad you got your quilts, and I hope they will make deployment a little easier for all of you. I believe it is still an active program. It was still going last year, 2016. It’s possible they haven’t updated their Facebook page. Try to start on the YMCA website and look for Kid Comfort. Did you try going to the office on post? They say you have to pick it up. And it says it takes 1 to 2 months to make. Good luck. Hello! This is Jess from the ASYMCA. This program is still active, but quilts are actually taking 3 months on average to be made and shipped due to the larger volume of quilts we receive. Please update your post if possible as the 1-2 months is no longer accurate. We have a lot of families that become disappointed when they don’t receive their quilt in 1 month, but our volunteers can only work so quickly with the large volume of requests. .. Also, the YMCA website is completely separate from us. We specifically serve junior enlisted service members and their families at the Armed Services YMCA. Our website is asymca.org. Thanks for sharing! Thank you so much for letting us know! I will make those updates. I requested quilts for my boys back in April and we still haven’t received them 🙁 do you know if the program is still active? Yes, it’s still active, but the average wait time for a quilt is longer due to so many families requesting them. It is now taking at least 3 months but it sounds like you have waited twice that long. Did you try emailing the same person you originally sent pictures to so you can follow up? 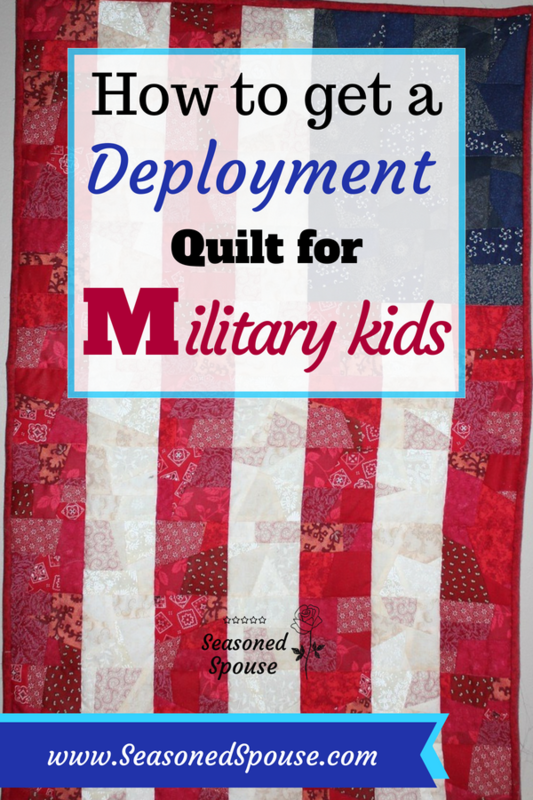 How do you volunteer to help with the deployment quilts for Kids? 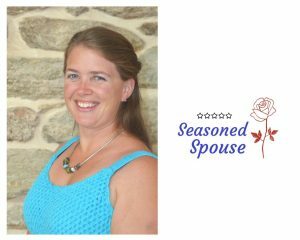 My husband is active duty and deployed. We are in MS. I couldn’t t find one for the state of MS . How Do we apply to get one of the quilts? 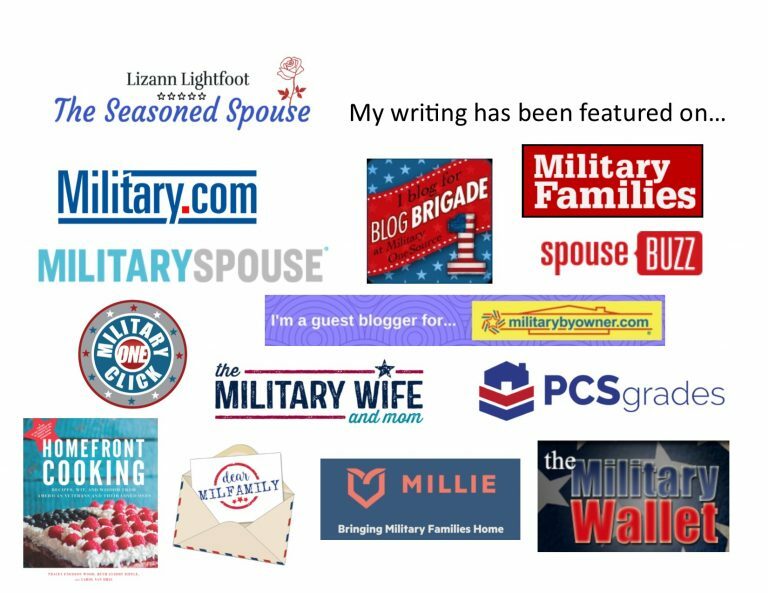 Hi Melissa, thanks for reading, and I hope you can get to use this program during his deployment! If there isn’t an ASYMCA center in your state, you can apply to one at the next closest state. They may ask you to pay shipping to mail you the quilt. Sometimes there is a backorder on these projects, since they are done by volunteers. But I hope you can find one that is willing to work with you! I contacted the ASYMCA and they said you have to live near one to get a blanket. The nearest one to us is in Illinois. I live in MN. So if you don’t live near a ASYMCA, you children won’t get a blanket. Ahhhh, I’m sorry to hear that. But I understand they have limited supplies and volunteers, so it makes sense they have to set limits. Another idea that may work– if you have a friend or contact in Illinois, perhaps they could help order the quilt for you and pick it up to ship to you?